Stocks are closing mixed on Wall Street as gains for banks are offset by losses elsewhere in the market. Bond yields climbed to the highest level in four months Wednesday, sending bank shares higher and weighing on utilities and other high-dividend payers. Technology companies also did poorly. Energy stocks rose. JPMorgan Chase rose 2.9 percent, and Halliburton rose 2.3 percent. Microsoft fell 1.3 percent. The S&P 500 rose 3 points, or 0.1 percent, to 2,907. The Dow Jones Industrial Average climbed 158 points, or 0.6 percent, to 26,405. The Nasdaq slipped 6 points, or 0.1 percent, to 7,950. Small and mid-sized companies fell. More stocks fell than rose on the New York Stock Exchange. Major U.S. stock indexes edged mostly higher in midday trading as gains in financial companies outweighed losses elsewhere in the market. Energy stocks rose along with crude oil prices. Homebuilders declined following a mixed batch of housing data. Technology companies lagged the rest of the market. JPMorgan Chase rose 2.5 percent, and Halliburton rose 1.8 percent. The S&P 500 index rose 6 points, or 0.2 percent, to 2,910. The Dow Jones Industrial Average climbed 197 points, or 0.8 percent, to 26,446. The Nasdaq composite slipped 10 points, or 0.1 percent, to 7,945. Stocks are opening higher on Wall Street as the market builds on a solid gain from the day before, which came despite the latest ramp-up in trade tensions between the U.S. and China. Banks and energy companies were leading the gains Wednesday, while safe-play stocks like utilities and real estate companies lagged the market. JPMorgan Chase rose 1 percent, and Halliburton rose 1.9 percent. AutoNation rose 2.5 percent after announcing that its CEO was stepping down. The S&P 500 index rose 3 points, or 0.1 percent, to 2,907. 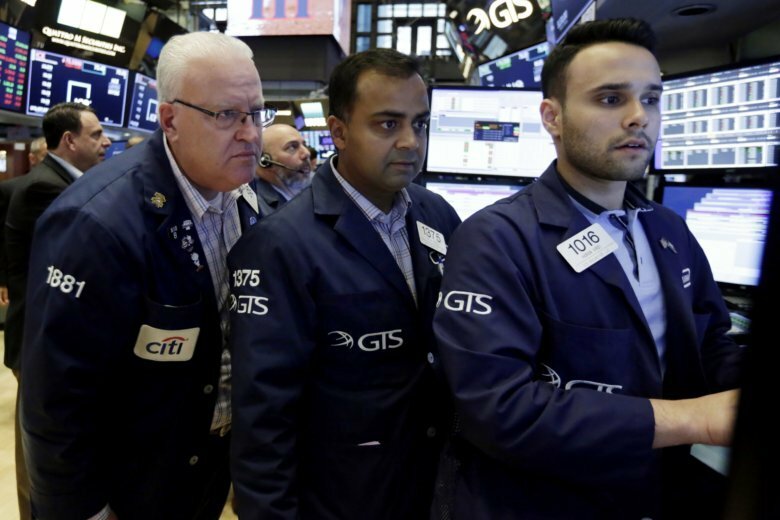 The Dow Jones Industrial Average rose 110 points, or 0.4 percent, to 26,351. The Nasdaq composite slipped 14 points, or 0.2 percent, to 7,943.